Kabaq 3D Food Technologies is an Official Snapchat Lens Studio Partner. 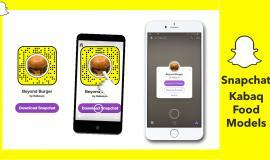 We work with Food brands to design creative AR experiences using Snapchat AR Lenses. Deeplink Snapchat experiences through websites, newsletters, etc. The majority of Snapchatters use the app for communicating and exchanging content with their closest friends, not a wide audience. And 87% of users rank close friends as the most influential factor in purchasing decisions, according to research commissioned by Snap. So brands can theoretically tap into the app's millions of daily users, and convert them into brand advocates at scale. *Business Insider. Instagram, Snapchat, Facebook, Pinterest created a new era for food photography & sharing. They became one of the main discovery platforms for restaurants and dishes. Restaurants had to adapt to the change by preparing more "Instagram-worthy" dishes to attract customers not only with taste but with visual appeal as well. In addition to pictures, videos have made their mark as well. Video media of colorful rainbow bagels or melting cheeses generated thousands of visitors to those restaurants. Now companies like Snap, Apple, Microsoft and Facebook are investing heavily in immersive technologies augmented, virtual and mixed reality. We believe the future of viewing and ordering food will be immersive, within AR, MR and VR environments.